TRY: Charles Piutau. CON: Ruan Pienaar. 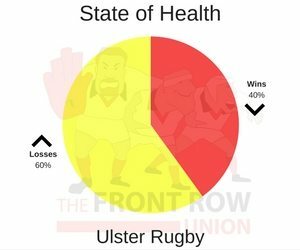 Sorry I’m a bit late getting this one up but I wanted to do a bit of research over past performance just to see how typical Ulster’s current results are. Now we did hit the 40% mark in 2011-12, the season we went to Twickenham for the Heineken Cup Final, a four run sequence of losses against Ospreys, Dragons, Treviso and Scarlets coupled with further defeats to Leicester and Glasgow putting us in the four wins out of ten category but crucially one of the wins was against Clermont at home and we had two gimmies against Aironi and a thrashing of Leicester at home in the HC to get us out of the group that time. We also hit the dreaded 40% mark in January 2015, losses to Leicester and Toulon kick starting that run which reached it’s nadir with a home loss to Leinster on 3rd January 2015. In November of that year a home loss to Saracens and an away loss to Leinster topped off a run of indifferent form which started at the end of the previous season with successive losses to Glasgow! 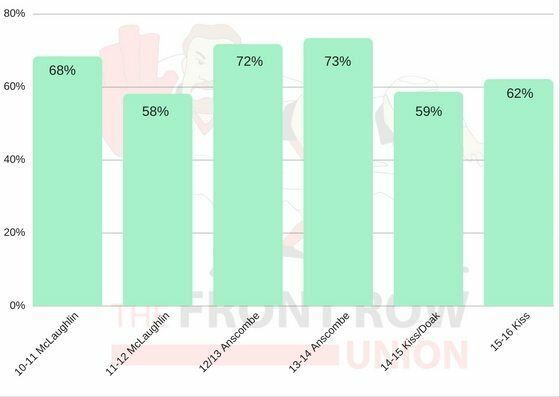 We did make top four finishes the last time we hit 40%, losing to Glasgow and then Leinster in the semi finals and our season win averages ended at 58% and 62% respectively. However the last two times we qualified for Europe our win averages for the season were at 72% in 2012-13 and 73% in 2013-14. Our current season average (all games this season) is at 60%. If you want to look at our win percentages by manager, here’s the last six seasons. And so to the game. Our win ratio against Leinster in the last ten matches is 20% so it should be no surprise that Ulster suffered another defeat against our neighbouring nemesis! As is so often the case, for us supporters, it’s not so much the loss but the nature of the defeat and Ulster were out of this game, dead and buried, after a poor first half performance. They conceded the softest of tries to Rory O’Loughlin in the opening minutes and the conversion and a later penalty by Isa Nacewa pushed the score along to 10 – 0 by the end of the first quarter. Ulster had their chances with Ruan Pienaar fluffing a couple of penalty kicks and Tommy Bowe dropping the ball, when he was through to score, but another fluffed lineout saw Luke McGrath race over unchallenged for the hosts second try; Nacewa converting to take the score to 17 – 0 at the break. The result was confirmed minutes after the restart as O’Loughlin raced onto a kick ahead for his second try, which remained unconverted, for Leinster to lead 22 – 0. Ulster did up their game somewhat, but it was too little to late, and despite the Leinster penalty count rising steeply, which saw Jack McGrath spend ten minutes in the bin, the visitors were only able to manage a try by Charles Piutau in the closing minutes. Pienaar finally dissected the posts with his last attempt to give a final score of Leinster 22 Ulster 7. Ulster: Charles Piutau, Andrew Trimble, Darren Cave, Stuart McCloskey, Tommy Bowe, Ruan Pienaar, Paul Marshall, Andrew Warwick, Rob Herring, Rodney Ah You, Kieran Treadwell, Franco vd Merwe, Clive Ross, Sean Reidy, Roger Wilson. Replacements: John Andrew, Callum Black, Jonny Simpson, Pete Browne, Chris Henry, Brett Herron, Louis Ludik, Jacob Stockdale. To finish on a positive congratulations to Jonny Simpson on his debut, especially as he did stand out with a strong personal game.